Valentine’s Day is just around the corner! 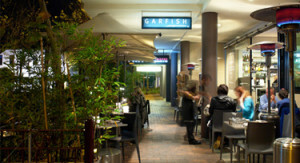 If you’re thinking of taking the opportunity to spoil your loved one, why not consider a meal at Garfish to mark the occasion? We love helping to make the day memorable and each of our three restaurants has something different on offer. As the old saying goes, music is the food of love, and at Manly we’re taking this idea to heart. As well as a delicious set menu at $80pp or $110pp with matching wines, our diners will enjoy live entertainment by Michael Duchesne. Michael is a singer, multi-instrumentalist and song writer who appeared on the debut season of ‘The Voice Australia’ and made Seal’s top 6 of final performers. These days, Michael performs at some of Australia’s top live venues and festivals, recently sharing the headline act with Lionel Cole at the Manly Jazz Festival. View Manly’s Valentine’s Day menu here. Call 02 9977 0707 for reservations in Manly. If you’re after an intimate atmosphere, our Crows Nest restaurant is offering couples a relaxed 3 course dinner option priced at $75pp this Valentine’s Day. Crows Nest takes advantage of the long summer evenings with an alfresco setting and it’s an ideal option for those living on the North Shore. Call 02 9966 0445 for reservations in Crows Nest. Please note: the set menu does not include wine. Moments from the city and habour foreshore, yet offering a personal dining experience, Kirribilli lets you enjoy the buzz of the city in a relaxed setting. On the night you can enjoy a 3 course dinner priced at $75pp. With seating indoors and out, we’re within easy walking distance of North Sydney and Milsons Point train station if you’re coming straight from work. And don’t worry if you over indulge–why not take a stroll after dinner under the harbour bridge while you enjoy the city lights? Call 02 9922 4322 for reservations in Kirribilli. In the mood for a lunchtime celebration? On Valentine’s Day all three of our Garfish restaurants will also be open for lunch, serving their seasonal a la carte menus. We look forward to helping you celebrate!